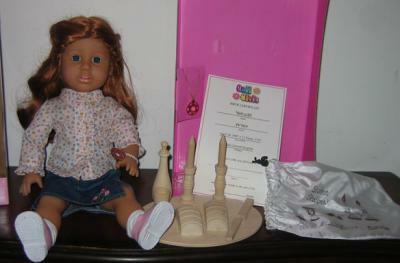 Gali Girls were created to give young Jewish girls an opportunity to incorporate positive values into their doll play. While the majority of dolls in today’s market focus on fashion, makeup and boyfriends, Gali Girls reinforce the positive values that have kept Jewish tradition alive and growing for over 5,000 years. The Gali Girls Jewish History Series captivates and educates the young reader about different Jewish communities throughout the ages and throughout the world. From Russia, to China, to Ethiopia, and beyond, each book tells the story of a young, brave Jewish girl, who overcomes the challenges she encounters by relying on Jewish values, Jewish community, and a very strong sense of self. Q. What are Gali Girls? 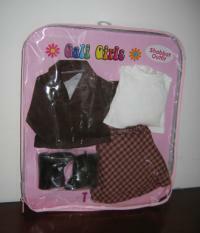 A. Gali Girls are the first Jewish dolls of their kind. Gali Girls represent Jewish values such as modesty, kindness, respect, and charity, among others. Gali Girls are modestly dressed in trendy shirts and skirts to distinguish them from most other dolls on the market that are dressed to accentuate their bodies." The Gali Girls are the brainchild of Aliza Stein, of New Jersey. "I was at the toy store with my kids (two boys), when I took a close look at the dolls in the doll aisle", Stein said in an interview. "What I saw was both fascinating and horrifying. Most of the dolls were Barbies and Bratz and they seemed to be more about taking clothes off than putting them on. Most had heavy make-up -- and then there were the boyfriend dolls on their motorcycles." Stein had been working as a professional recruiter for many years and was looking around for a business opportunity. "That got me thinking that there was probably room, and definitely a need for a doll that would be more about empowering girls and promoting positive values through doll play." Because her Jewish faith is important to her, Stein also wanted to create a doll that would help young girls connect with their Jewish heritage. "And maybe learn something about Jewish culture and communities in the past and in the parts of the world they may know little about. The company began selling dolls in November, 2004 until they went out of business in 2013 when Stein decided to move on to other things. 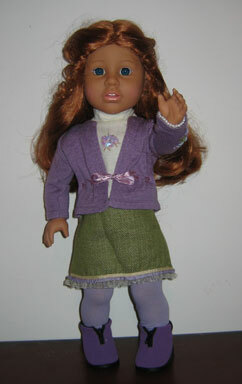 The first dolls were modern, but they started selling historical dolls and accompanying books in 2005. 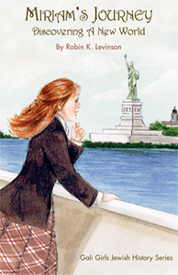 This first book, "Miriam's Journey: Discovering a New World", by Robin K. Levinson, follows 10-year-old Miriam Bloom and her mother and sisters as they journey to America to join their father who has already left Russia for America, fleeing persecution and looking for greater opportunity. Miriam and her story are based on Levinson's grandmother's real life story. You can purchase a limited edition Miriam doll -- a redhead who is dressed in the same outfit as Miriam in the cover illustration of the book. "Finding Robin Levinson was a dream come true", Stein said. "I can give her a vague idea and she immediately comes up with marvelous story outlines!" Stein is equally pleased with the book's illustrator, Drusilla Kehl, who Stein said managed to come up with beautiful drawing that matched the images she had in her mind's eye. The second book, "Reyna and the Jade Star", is set in 1175 China and just came out in July, 2006. The Reyna doll is a departure from the previous dolls: she is a slim, all-vinyl doll manufactured for Gali Girls by Carpatina Dolls. Reyna is a gorgeous, high-quality doll that is essentially the same as the Carpatina Fantasy Adventures Ana Ming doll but with bangs. The third book, from 1662 America, was "Shoshana and the Native Rose", which, of course, had an accompanying historical doll. 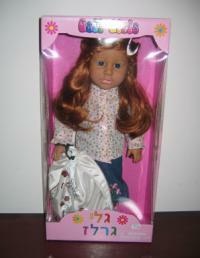 The soft-body dolls themselves are decent quality, comparable to the ones you would find at Target or Wal*Mart. The same Lotus doll has been sold under different names by different companies, such as Lillian Vernon and Constructive Playthings. However, with the Gali Girls, you are buying more than just the doll, of course. The redhead Miriam doll has a wig that is exceptional quality and style and it really distinguishes her from her rooted-hair, Gali Girl sisters and from those being sold elsewhere. Her clothing is also cute and well made, though basic. The Shabbat kit that comes with the dolls is wonderful and justifies the extra cost of the doll (compared to similar quality dolls) by itself. It is sturdy wood and comes with candles, wine cup, wine decanter, knife, challah, and challah cover. It would be a fun project to paint the set with your daughter but it is nice even in its unfinished state. The doll also comes with Jewish star (Magen David) bracelets for the doll (non-removable) and girl and a birth certificate. The packaging is nice and there is no excessive use of fastening like with so many other play dolls these days. On the left is a Gali Girl showing how well she fits in the American Girl Today, Go Anywhere outfit. Magic Attic- size shoes fit her best though some styles of the larger American Girl shoes will fit just fine, such as these purple zip boots. There is a small line of outfits available separately for the dolls, such as the Miriam's Journey outfit shown to the right. The packaging is nice with a zippered bag that can be re-used as a garment bag. There are only a few other Jewish girl/doll pairings in the play doll market. Three are American Girl Rebecca from the BeForever collection, Lindsey, the first Limited Edition Girl of the Year doll from American Girl, and Heather from the Magic Attic Club. Rebecca's heritage is central to her story, but Lindsey's Jewish identity is only incidental, coming up mainly because of the rather stereotypical disruption in her family caused by planning her brother's up-coming Bar Mitzvah. Magic Attic Heather's Judaism is mentioned in passing in most of her books, with the exception of the excellent "Vivé, Heather! ", where she goes back in time to explore her roots as a Jewish Gypsy in Spain. The Gali Girl dolls are marketed to Jewish girls with the admirable goal of helping instill a sense of pride and increased knowledge of their culture. This doesn't mean that they aren't appealing to girls of all backgrounds, however. As author Levinson observed about the first book, "Although Miriam is a Jewish adolescent, this story conveys positive, universal values, and provides an informative and exciting lesson in Jewish history. It’s a story that boys and girls alike can enjoy and relate to, as well as readers from all religions and cultures. There’s danger, adventure, and conflict. The main characters are strong, smart, and courageous. Basically, it’s a good story with a good message." What more could you ask for?